A Big Thank You to Robynn Gabel , over at dupler. 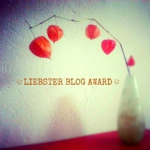 org for surprising me, by nominating me for the Liebster Blog Award. I was stunned to find this amazing honor when I logged in the other day. To become a part of this rich community of Bloggers was so overwhelming that I had to take a few days to calm down. So now that I have, I’m happy to offer that wonderful feeling, and have other bloggers join in on the fun. Liebster is the German word for “dearest” or “most cherished.” You can get nominated for a Liebster Award, regardless of how many followers or likes you haven’t racked up yet, if SOMEBODY out there loves your blog enough they can single it out for special recognition within the blogging community. List 11 random facts about you. Answer the questions that were asked of you. Nominate 11 other blogs for the Liebster Blog Award and link to their blogs. Notify the bloggers of their award. Ask the award winners 11 questions to answer once they accept the award. I’ve seen more death in my lifetime than most people should. The Eleven Questions I was asked. Would you rather read or write? I would say write. What are you currently reading? A friend’s YA novel, she just published, and asked for a review. What is a favorite character name? At the moment it’s Zahila, from my, soon to be published, novel Inheritance. What is the piece of writing that is the best you’ve ever done? I don’t think I’ve gone there yet, as a writer. How do you reward yourself after reaching a goal? It all depends on the goal, which could range from opening a bottle of good wine to having a piece of chocolate. To break writer’s block, what do you do? I haven’t had that problem, but I’m told that reading often helps. If you had to decide on pie or ice cream, which would you choose? Pie, I’m not big on the cream. What is your favorite time of day? The in between times; just before daybreak and right before nightfall. Who is your favorite character in a novel? In your opinion, what was the best book adapted to a movie? What grammar error makes you the craziest? Nothing to do on a rainy day, movie or book? Writer’s block is it myth or fact? I hope you will join in on the fun and make someone’s day by passing on this fun and entertaining award. You are most welcomed! Lovely lady, I’m loving your work! Congratulations to you and thank you for the nomination. I had to show you some love, love your work! Thanks for the nomination. Congratulations. Thank you, love a good scone and strong coffe. I wanted to show you some love, is that I a smile? The best time to laugh is any time you can. It’s a tie between Long John Silver from Robert Louis Stevenson’s Treasure Island and Belgarath the sorcerer from David (and Leigh) Eddings’ Belgariad and Malorian books (I highly recommend the stand-alone novel ‘Belgarath the sorcerer’ though it makes more sense if you’ve read all the others). Scoundrels, both! Hitchhiker’s Guide to the Galaxy by Douglas Adams is the best book that has been adapted in to a movie but if you meant which movie is the best adaption of a book, then there are none. I love movies (LOVE them) but it pisses me off when my favourite books get buggered by Hollywood. I live in the city of Worcester (West Midlands, England), and there is a local strain of dialect that really gets me going bonkers: “How am you?” ARRGGHHHHH! As much as I do like the movies, I’d prefer a book, though I’d rather write than do either of those. Myth, just procrastination. There is always SOMETHING to write and there are so many sources of inspiration these days, just type writing prompt in to your thingy on your computer and tons of stuff comes up (I have four posts of writing prompts on my blog, extensive ones too!). Cake. No, wait, cookies. No, cake. Cookies! Cake! Its too hard! Can I have a bite of each? Huh?! Desk top, that’s where the computer lives, right? Lap top, where Santa sits the good boys and girls when they visit? Tablet is something the doctor prescribes. Lap top I guess then, as I hate going to the doctor, I don’t like computers but I do like going to see Santa (he’s a very nice man). I used to play a little guitar, I like to sing and I can hold a beat on a drum set but none of them very well, my creativity is definitely exclusive to my writing. I enjoyed reading them, thank you! Thank you! You know I had to come share the love with my poet friend. Thanks! You are an amazing poet, I had to pick you as a favorite! Congrats! I also consider myself an empathic person. We Empathics must stick together. Looks like you have been getting awards all day. Congrats and I’m going to give mine to my new friend at shooting Stars and Pixie Dust.